Recently Hyundai started producing GSM phones, earlier on this company was only well-known in Asia, as CDMA-terminals manufacturer. Pantech’s acquisition of Hyundai’s mobile division caused the appearance of new products. Pantach also bought such company as Cruitel earlier on. GSM market was considered as of the main vectors of company’s development. 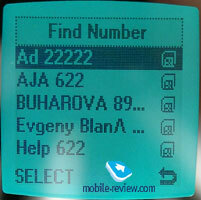 It may seem rather strange, but almost all Asian phone producers invade European market through Russia. 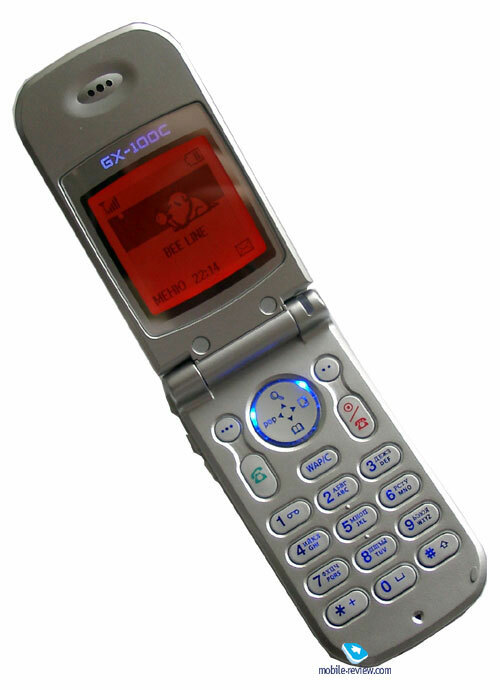 One of the first models which Hyundai had released, became a low-end clamshell phone GX-100C. 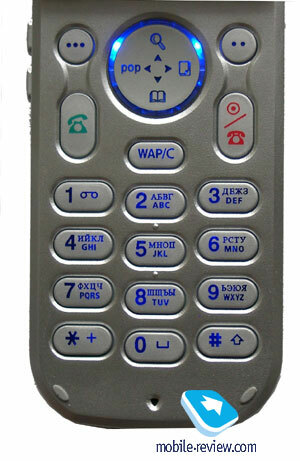 The phone has average size and a typical Asian design (silver case). The exact size is (83x43x17,6 mm), it’s not big, nor small. The phone has nice ergonomics, at least when the phone is closed. Phone’s weight is 75 grams, which is typical for this type of phone. 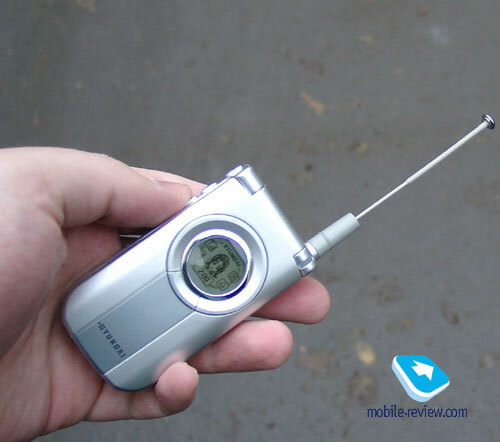 The first peculiarity of the phone is it’s antenna, it can be plugged out. You just have to pull up the antenna’s top in order to plug it out. It’s typical for CDMA-phones, but seems rather unusual for GSM ones. Actually there’s no real affect on the network’s reception level, it’s more like a psychological factor. 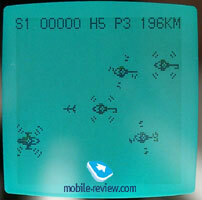 We actually tested this factor here in Moscow, and no differences between two antenna’s positions were found. Most likely such move was made to please the Asian consumers, who are used to such phones. There was a time in USA, when phone producers were forced to make such kind of antennas because the consumers didn’t believe that the phone could actually work without one, and refused buying it. The external display is located on the upper panel. It’s locked inside an eclipse frame. 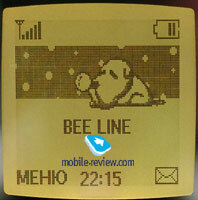 Screen’s resolution is 96x64 pixels, up to 2 text lines and two lines for icons can be displayed at once. 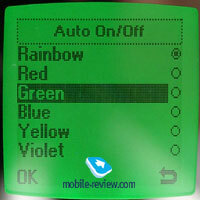 Everything is traditional, except for the fact that the display’s backlight supports 8 colors. Considering that this is a low-end phone – it’s a big advantage. It's rather silly to demand external or internal color displays now, such types of phones will appear only by the end of next year, although first models will be available in the next months. Current time and basic indicators can be displayed on the external screen, you can also place a screen saver that is presented as analogue clock, and of course the backlight with different colors. Service LED is located near the antenna, it blinks with green color. During the charging or talking it’s color will be red. 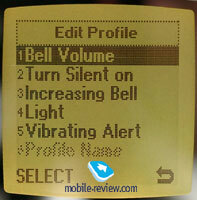 Volume control buttons are located on the left side of the phone. 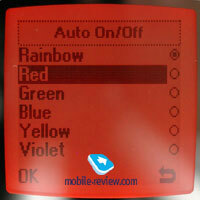 There is a special button for external display’s backlights activation. By the way, both external and internal backlights are working at the same time, that’s because they use the same LEDS. A headset connector is located on the upper edge, meanwhile system connector is located on the phone’s bottom, it’s covered with a rubber cork, which is connected to phone’s case, so, you won’t lose it. Screens resolution is 120x104 pixels, it’s almost square. On the other hand, because of oval edging of the screen, it seems a bit stretched horizontally, which is not true. The display supports four grey scale. 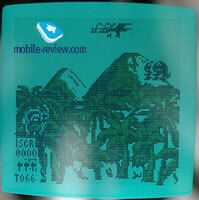 The picture looks nice, although the screen may flash when it encounters direct sunlight. You can see a sun spot on many pictures, we tried to get rid of it, and however it was useless. While you’re working with the phone these flashes are unnoticeable, they aren’t bothering or anything like that. 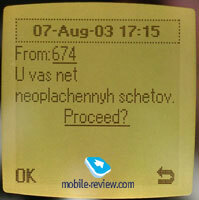 Internal display can show up to 6 text lines, the font is rather thick and reminds of the one used in old Ericsson phones. to run a few steps forward, I will tell you a secret, the phone is actually very similar with old Ericsson phones, that’s because hardware part is from Broadcom, and software part was most likely licensed from a company which used to develop software part for Ericsson phones (as far as I remember, it’s located in Great Britain, although I don’t remember its title). A lot of factors lead me to this conclusion, similarity of fonts, menu structure and other minor things. Same technology is used by many Asian producers, like Bird. But let’s get back to the phone, shall we? The keyboard is made of rubber with an exception for navigational key, that is made of plastic. Keypad’s button size is average, but they’re drowned into the case pretty much. Keyboards usage comfortableness can be rated as average. 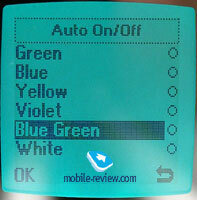 It’s backlight is blue, although it’s not spread equally, the brightest location is near the navigational key, meanwhile other buttons look a bit blurry. But this occurs only during complete darkness, if you’re using the phone during the midday or in a room with artificial lighting source – no problems will be noticed, all symbols will be seen perfectly. Back cover stores a battery inside it, Lithium-Polymeric 760 mAh type. 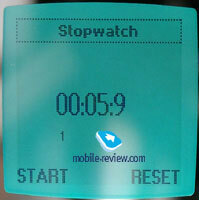 Hyundai claims that the phone can work for about 200 hours in stand by mode, and up to 2 hours during the actual talk. 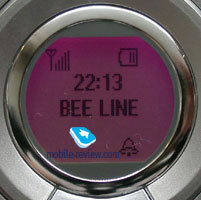 While we were testing this phone in Moscow, it worked for about 3 days with 25 minutes spent for talks daily. It takes slightly less than two hours for the phone to charge up. The last thing that has to be mentioned is the SIM-card holder. It’s presented with special toddler. The holder has two main problems, the first one is that it takes an effort to move it, it’s just too tight, and the other one is extremely unreliable fixation in end-position. So if you’re planning exchanging your sim-card quite often – this phone will not be suitable for you. Although, there is a high probability that you will get used to it. You can access the menu by pressing left soft-key. 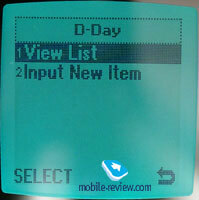 The main menu is presented by the vertical list of items, fast shorcut number navigation is supported. Sub-menus are presented in the same well. Shortcuts can be assigned for keypad’s buttons, and then you can access the menu item just by pressing one button during the stand by mode. Menu seems logical and doesn’t bring any difficulties during browsing. Localization is good overall, however there are some minor peculiarities. 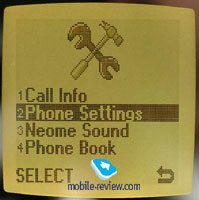 The English menu has title Bell for such settings, that are labeled as Tone or Melody by other phone producers, for instance. Call list. 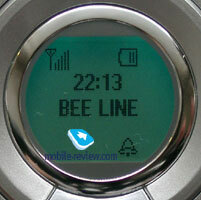 Lists of dialed/received/missed calls; date and time can be viewed for every entry. Phone settings. Profiles are located here, they are standard, and no new features are introduced, you can just personalize (ring tone, sms alert, vibrating alert, etc) each profile for your needs. 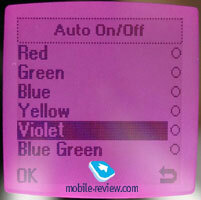 Display settings are located here as well; you can choose backlight’s color and logos from internal and external displays. 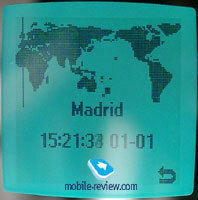 Calendar, World Map, animation, digital clock and day of week can be used as the external screen’s logo. 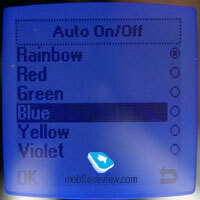 You can also turn on/off service LED from this menu. 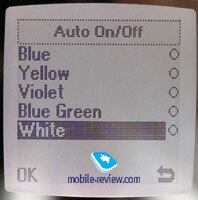 An interesting fact is that from this menu, and not from the phonebook, you can assign custom backlight color to certain entry of the phonebook. 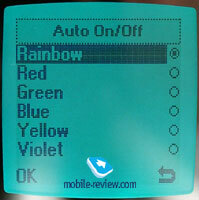 The feature seems to be rather interesting and useful considering the number of available backlight’s colors. You won’t see anything special while choosing the appropriate ring tone, only folder names and about 5-6 melodies in each. Phonebook. 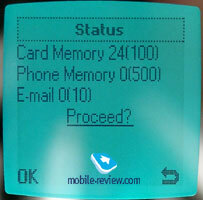 500 numbers can be stored in phone’s memory, only one number can be assigned for each entry. Groups are supported. You can also save up to 10 e-mail addresses. 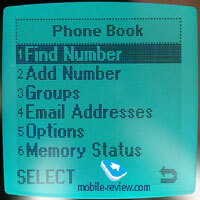 Both SIM-card’s and phone book’s entries are shown in common list. Fast search is present. Messages. 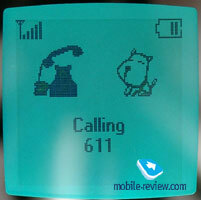 It takes quite a while (5-10 seconds, depending on the number of messages) for the phone to open an SMS from SIM-card. 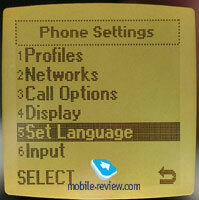 Predictive text input, T9 is supported, no other special features are available. Accessories. 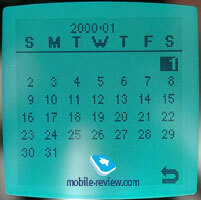 The calendar is located here, it can be displayed in Monthly mode. 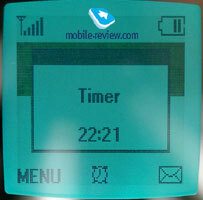 Here you can add not only tasks, but set the time for warning about them as well. This function is located right here, in the D-Days menu. It’s hard to judge if such location is good or not. The phone has an ordinary alarm clock, stopwatch with intermediate results support, countdown, World Time function and a calculator. Two games are available, Hell Fire (arcade, helicopter flies and kills other helicopters), Stone Axe (you’re throwing axes into barbarians). Games are not very fascinating, nor addicting. The phone has wap-browser 1.2.1. GPRS is not supported. Sound quality is nice; speaker transfers the interlocutor’s voice clearly, without any annoying noises. 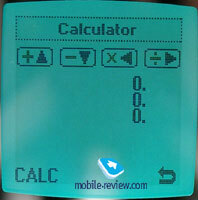 No problems were encountered during the testing period; the phone is competitive in this term. Presence of pulling out antenna is just a psychological factor, and it doesn’t have any real affect on the network reception quality. Vibrating alert is slightly below average level. Manufacturer claims that GX-100C has 16-tone polyphonic ring tones, however it doesn’t sound as well, as it’s competitors with same amount of tones. The melodies sound too sonorous and they get slightly distorted. In my opinion, we have 4 tones, not more. You can listen to the ring tone samples and make up your mind. Considering phones functionality, we can’t say that it has the maximum amount of functions, more like a typical budget model. People love clamshell phones that are why there will be a certain amount of demand for Hyundai GX-100 C. Other advantages of this phone are: nicely built case, interesting design and various colors for displays backlight. 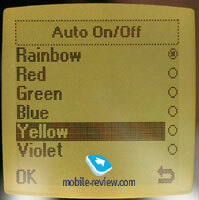 The disadvantages are: weak polyphonic ring tones, no GPRS support. Considering that the phone costs about 160$ at the moment it can’t be called optimal buy. The price will decrease in the nearest future, and the phone will cost about 130$, which is more interesting. In our opinion the price will still not be optimal, the right one should be around 110-115 dollars. This price is compiled by the phone’s function and image-part. Clamshells are losing their exclusiveness and attractiveness, and are turning into a typical phone in another variation at the moment. 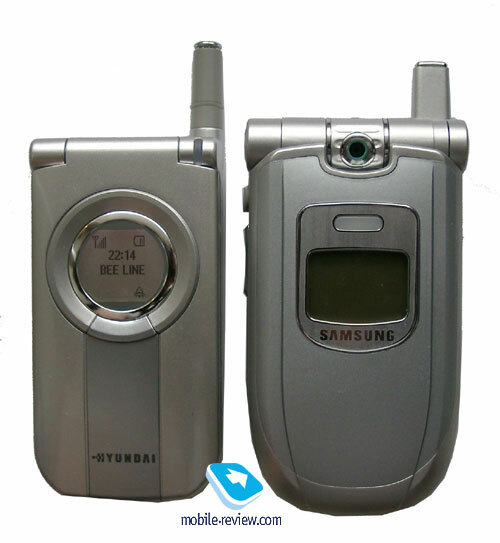 Main competitors for this model is Philips 330, but with the release of such phones as Motorola v150, Sagem myC-2 that have color displays, attractiveness of Hyundai will certainly fall down, unless the price will be decreased. That’s why we predict huge price cut in February (about 100$), otherwise the phone will simply disappear from the market. Paying 100 dollars for GX-100C makes it a good budget phone and worth buying.